Cupboards Kitchen and Bath: #KBTribeChat and #Coverings2012! A few days ago I mentioned how important trade shows can be to the design professional. Now, you get to see one of those benefits in action! #KBTribeChat is a regular chat on Twitter that brings kitchen and bath professionals together to discuss common issues, products, and events. 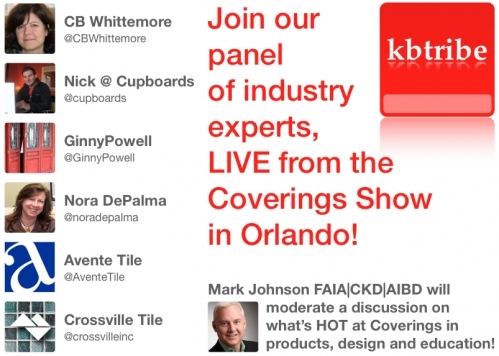 This upcoming Wednesday, #KBTribeChat will be LIVE from Coverings in Orlando, Florida. Making the chat even more exciting, a panel moderated by Mark Johnson FAIA will collectively host the chat right at the show! If you'll be at the show, make sure you're there. If you're still at your home base, you'll be able to follow along by using the hashtag #KBTribeChat on twitter. Stacy Garcia and the gang at #KBTribeChat has all the information you need to know about how to join in and participate. The chat likes lurkers, but loves participants. Get involved! Me too, Ginny- Will be an awesome experience! Nick - Thank you for posting about next weeks chat! Mark has assembled an exciting panel and we can't wait for you all to report back on the show! This is exciting. Should be a TON of information during that hour... Can't wait! Thanks for adding this event to you blog, Nick! It's an exciting way to meet new and old faces from our Twitter community at #kbtribechat. Thanks to you for organizing such an awesome group- Glad to be a part! Looking forward to this opportunity to share what is hot in the world of tile at Coverings with a great group on KBTribeChat! Thrilled and honored to be on the panel. Excited to meet many of you IRL for the the first time after years of sharing via Twitter. It will be great to see everyone, Bill! 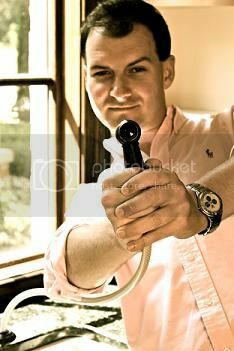 Nick, this will be fantastic! Thanks for getting the word out. I'm delighted to learn from this marvelous group of experts what they consider hot! I can't wait, either. Should be an awesome time- definitely cool to have some industry heavyweights all in the same place!